I've finished the Regia cotton socks--yay! They fit OK. I'm wondering if they'll shrink a bit when washed and dryed? If so, it will be fine, as they are a tad loose in the ankles. I must be losing weight in my ankles, haha! Last night I cast on for some Fluted Banister socks for daughter. 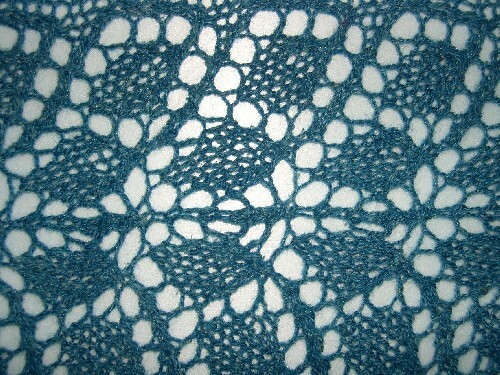 The pattern is from the Six Sox KAL. 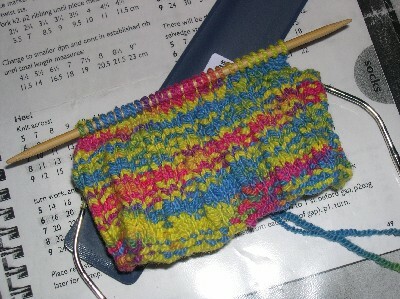 I did a pair last year in Sockotta (blues) and am repeating the process using pink/red/yellow/orange Sockotta. I love the yarn and the pattern. We attended a painful soccer game yesterday. It was painful because the girls played so horribly. I think the coach was about to burst a gasket! In her post game talk to the girls, she told them they made a bad team (the opponents) look good. I must agree with her. I'm not Overly Competitive Live Life Through Your Kid Mom like some of them are, but I can certainly tell when the kids look like they are sleeping on the field. Oh well, only three more games and the spring soccer season is over. Daughter is signed up for a couple of volleyball camps this summer and for CIT (Counselor in Training) camp. Volleyball is her true love, and she's actually pretty good. I don't see a need for her to be on every athletic team at school (some kids play a sport every season) when she can just concentrate on where her strength is and be her best at that. Also, she's really interested in art and drama and does well at both. She needs to allow time for those things, too. Spring Break starts Monday, and I can't wait. I've taken the week off, and we're just going to do whatever we want. At least one day we're hoping to spend with one of her friends and his mom. We're talking about going to one of the mini-golf/amusment park things in town for some golfing and go cart riding. It should be fun. Daughter also wants help with a sewing project. I'll try to get knitting pictures up over the weekend. It's good to be home from Kansas! I don't think I was properly warm the entire time I was away. One nice perk of my hotel was that I had a suite (living room, dining room, kitchen, bathroom, and bedroom areas) and it had a gas fireplace. I used that fireplace every night I was there! The suite looked like it was as big as an apartment I lived in in the Atlanta area several years ago! The meeting was fine, and it was great to see my friends. It's even better to be home, though. I haven't touched knitting in about a week, unless you count packing my project and then unpacking it. There was just no time! I did read a great book this week: The DaVinci Code. I figured wiht all the controversy surrounding it, I'd better grab a copy while I can. It was much better than I'd thought it would be. For me, it really was one of those "can't put down" books. Later today, we're going to see a play at daughter's school. Some of daughter's friends are in the play. In fact, one really great kid is playing....are you sitting down?....the rear end of a cow. I guess all great actors have to start out somewhere. Rumor has it that the cow gets milked during the play. Poor kid. Seriously, the school is in a big building period right now. We're getting a wonderful new gymnasium and art center complete with a state of the art (no pun intended) performing arts complex. This will be the last production in the existing performing arts center, and I think it's important to be part of that. I'm off to unpack and spend some quality time with my Mr. Washie. I tried on my bright sock last night, and my fat ankle was swimming in it. So...ribbit, ribbit. I started over with a 48 stitch cast on (still on size 3 US needles) and did a K3P1 ribbing. I think the ribbing looks better than the K2P2 did in this yarn. I worked up to picking up the gusset stitches last night and am pleased with how the sock is turning out. Of course, it's yet to be seen if the sock will actually fit me or if daughter ends up with this pair. We watched Idol last night. It was not a pleasant hour! I really don't like Stevie Wonder's music at all, and I certainly didn't enjoy hearing any of the Idol contestants sing it. I think that Chris probably did the best with his rendition of a Red Hot Chili Peppers rendition of a Stevie Wonder song. It was far enough removed from SW to be somewhat tolerable! My picks for the top two this year are Chris and Mandisa. I think they are vocally the strongest competitors. The weakest competitors, IMO, are Lisa and Bucky. However, I think Kevin will be voted off tonight. He bombed the SW song, but he has a good voice for other things. His version of the Josh Grobin song last week was awesome. Unfortunately for Kevin, I think the look is going to kill his chances, especially now that he's been compared to Chicken Little! Chris, Elliott, Kevin, Ace, Taylor, and Bucky. And, for the girls (again, best to worst order): Mandisa, Katherine, Melissa, Paris, Kellie, and Lisa. That is vocals only. My least favorite is of course Kellie. I don't find dumb, especially fake dumb, very attractive. I'm finding this yarn very interesting indeed. I think I like it... It is definitely different than any yarn I've knit before. I'm using a cast on of 56 stitches on size 3 needles. The cuff looks a little fat, but so do my ankles. Notice that I'm doing a short cuff--2 inches in fact. These are my experimental socks, so if I find that 56 stitches are too many, I can do something different in my next pair. Our LYS sells Fixation, so it's no problem to get more yarn! Me (knitting away on Fixation socks): These are going to be some fun socks. Husband: What? What do you mean "fun socks"? Me: You know, fun to wear. Husband: Only a woman would find clothing to be "fun". Katie and Kim, I'll get out there with a blanket to cover my plants if the weather gets cold. I'm hoping we're past the frost and freeze for this year. Kim, I like the succulents everyone else picks over, too. My husband had some plants when we were in college. One was called Lithops, I think. It was a cool plant. Wal Mart didn't have a huge selection, unfortunately. Judy, I agree with you that reading does not have to be for a higher purpose. It just has to be fun for me! Amy, it is good to see you stop in when you must be so busy with Yarntopia! Mel, it is nice to meet you! Vera, Elizabeth, Valerie, and Amanda, Hi!! I'm glad you stopped in. Vera, we'll have to make another try at meeting up at Knit. I'm feeling rather lazy today. It's taken effort to do anything! Anyone else have that problem with Mondays? 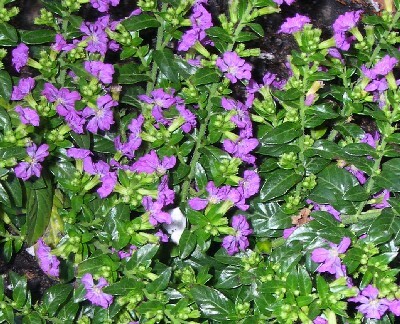 Next, here's the Mexican Heather. Isn't it pretty? We had a great time planting. I hope everything does well. We also have some zinnia seeds and some sunflower seeds (two varieties) to plant. 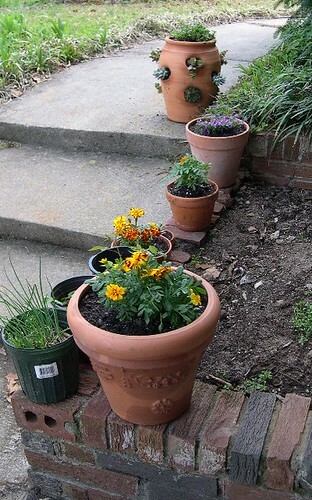 I'd also like to get some bell pepper plants and some herbs for the yard. Lowes has some gorgeous plants right now, so maybe I can get back this week to buy some. We bought a new table and chairs set for the deck last night. We found a good deal on a 42 inch square table ($48) and chairs ($25 each) at Lowes. We all enjoy sitting on the deck, spinning or just relaxing. Now that we have the table and chairs, we can also enjoy eating some meals out there....as soon as we get the table put together! 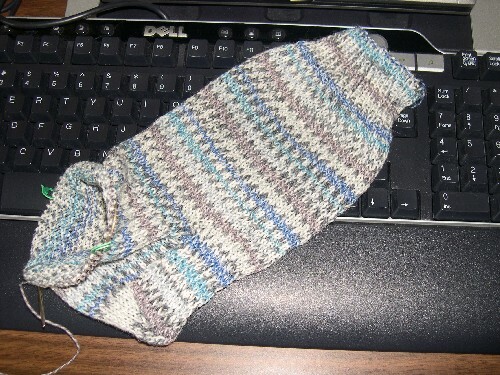 I'm still toddling along with the Regia sock. 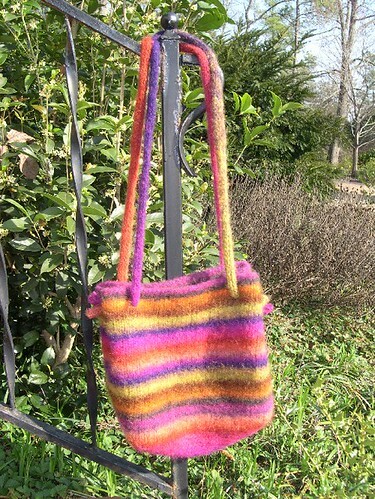 It was just to pretty to stay indoors and knit this weekend. Like it or not, spring is here! If it weren't for these allergies, I wouldn't mind so much. Everything in our yard is budding out or blooming. The birds are singing, the squirrels are scampering. With temperatures in the 70s and 80s, I've been enjoying a little outdoor time. I got the urge to plant things yesterday, but I'm not into gardening. We have a built in planter at our front door, and I filled it with some nice portulaca. Mine is supposed to be yellow, but last year, my plants actually produced a variety of colors. I have a brown thumb, but the thing I like about portulaca is that it seems to be pretty tolerant. The front door gets a lot of sunlight and a lot of heat in the summer. The portulaca we had there last year lasted until about November when we had some freezing temperatures. The plant didn't even fuss too much when I forgot to water it. 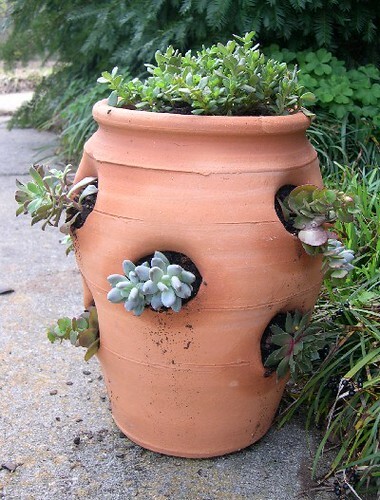 We also have some plants in pots--Marigolds for daughter, Mexican Heather, and a strawberry pot planted with a variety of succulents. I'll post pictures later in the week when the camera card reader starts working again. I've not knit all weekend even though I had planned to finish up my pair of socks. Instead, I've been reading The Shop on Blossom Street. I'd heard mixed reviews on the book, but I enjoyed it. I found the characters likeable and interesting. Their stories brought tears to my eyes a few times, too. I'd planned to "savor" this book rather than reading it quickly as I'm prone to do with fiction. It was a page turner for me, though, and now I'm eager to read the next in the series, . I finished the first of the Regia cotton socks. It's a bit too big, so hopefully a run through a hot washer and dryer will tighten it up a tad. I started the second sock last night and intend to get it done over the weekend. My next sock project is going to be toe up short socks using Cascade Fixation. I have two balls of a horrible bright yellow variegated in my stash. They should make great summer socks! I did a little bargain shopping yesterday--found a pair of Birkenstock sandals on clearance for $30! These are the Arizona two strap style. The straps are not leather but some sort of fabric printed in a burgandy, pinkish floraly paisley style. How's that for a description? They feel good on my feet, so 'nuff said, right? Daughter loves them, so we're back out to the store today to see if they have a pair in her size. I had a most interesting and weird encounter at the shoe store. Some lady--also a customer--decided to lecture me on the style of shoe one should buy to give a slimming effect to the foot. Apparently, she'd been watching one too many episodes of Oprah and heard about this shoe thing on that show. I told her that frankly I don't care how my feet look as long as they feel good in the shoes. She then went on to discuss the local diet center (the one where you eat nothing but protein bars, have weekly B-12 shots, and take vitamins) and why she's afraid of exercise and joining a place like Curves. Did I mention that this entire conversation took place with her whispering so softly I could barely hear her? I was finally able to escape this woman and buy my shoes that make my feet look wide but feel incredible. Since I mentioned Curves in the paragraph above, I should share with you that I've managed to lose a total of 16.25 inches. That is an additional 10 inches lost in February. I am shocked, because February was a hard month. I was terribly busy with work which meant we had a lot of take out food, and we had three birthdays with cake to contend with. I'm only able to squeeze in three workouts per week, but that's fine. I'm very pleased with my results. Is anyone watching American Idol? Kevin can thank my dear daughter for his being in the top 12. The kid voted for him 100 times Wednesday night. I can't say that I'm sorry to see Will go. He never did much for me. Gedeon was a surprise, though. I thought he had a good voice, and he seemed like a nice kid. I'd have cut Bucky in a heartbeat. He has managed to butcher just about every song he's sung. My top pick for the guys is Chris. It was no loss as far as I'm concerned for Kinnik to leave. I liked her, but she just wasn't cutting it with her singing. Ayla annoyed the living daylights out of me last night. There she is balling her eyes out because she got cut from Idol. Has she forgotten that she has that huge college scholarship to play basketball? Get over it and get a grip, girl! If it had been completely up to me, I'd have kept Ayla for another week or so and sent Kellie Pickler home last night. She is so irritating with that fake stupid, innocent country girl routine. Nobody is that dumb and sheltered. I've been to NC, and I know for a fact that they do serve calamari there. My top pick for the girls is Mandisa. She is a fantastic singer and performer. I hope that America will keep that in mind when voting rather than focusing on her weight. Yesterday was so gorgeous--sunny and warm. Today, the start of the weekend, is dreary and rainy. Why is that? I hope the weather clears so that we can do some things outside this weekend. If not, then I'll just sit and knit, knit, knit. There's a lot on my mind these days. Where do I start? I just read an article in the local paper indicating that there's a nationwide trend toward cremation instead of burial. I decided years ago that I didn't want my dead body put in an expensive box and buried. There is just something so morbid about that. I also think it's a tremendous waste of money and land! My dad was the first in our family to go "against the grain" and decide on cremation. He passed away 5 1/2 years ago, and I think some of the family were horrified that his body was cremated. We were carrying out his wishes. Daddy's ashes were divided among my mom, brother, and me. I have a tiny urn sitting by my desk. I much prefer this than some burial plot that I feel obligated to visit and take flowers. My dad is in my heart and my thoughts all the time. I don't need a special place to visit to remember him. When it's my time to go, I'll take a simple cardboard box, please, and scatter my ashes somewhere nice. Our backyard is one of my favorite places, so why not there? I realized recently that I waste too much time on line. That's going to change! Last month, I pared down the number of blogs I read and the number to which my own blog links. That's freed up a good bit of time. I also dropped several Yahoo groups which has also freed up time. Still, I was spending more time sitting at this computer than I wanted to. So....I've dropped discussion groups. That's right, no more Knitty and no more Knitter's Review. Actually, I pretty much stopped going to KR many months ago. I'm amazed at how much time I now have to knit, spin, and spend time outdoors. Also, I don't miss my former on line addictions. It's really rather freeing not to feel like I have to read or respond to the countless messages that come up on boards or mailing lists. There are many more productive ways to spend my time. 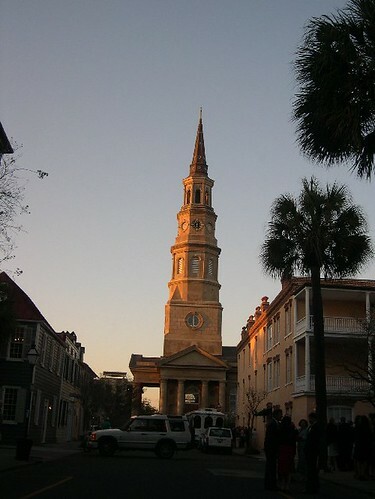 Yes, we were in The Holy City aka Charleston, SC. We attended a birthday party in the morning in North Charleston, then headed downtown in the afternoon and visited Knit. If you ever get down to Charleston, you've got to visit Knit! It's a great yarn shop. They have a little bit of everything. My only complaints are that parking is awful downtown--it cost us $8 to park in a garage, and that was just for a couple of hours at the most. Also, I found the prices at Knit to be a little higher than what I'd pay elsewhere. For instance, the same Blue Sky Alpaca yarn that I get locally for $7.50 was $10.00 there. Of course, Knit does have things I can't buy locally--like Koigu KPPM and loads of Lantern Moon needles. It's definitely worth a visit, and I'll be going back. Good news! We are one spinning wheel lighter! Yes, the Louet S10 has found a new home, and hopefully a loving owner. I'm so glad to be rid of the wheel. We didn't need it. Why keep something you don't need? My mom loved her Branching Out! Coming soon, photos of the Koigu I bought to make Charlotte's Web, my recently completed Gioia in Fuchsia Blue Sky Alpaca, and a progress photo of a sock I'm making in Regia cotton blend yarn. This gold medal was awarded to me (and thousands of other people!) 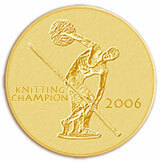 for finishing my Olympic Knitting project. Scroll down a few posts to see my Clapotis.